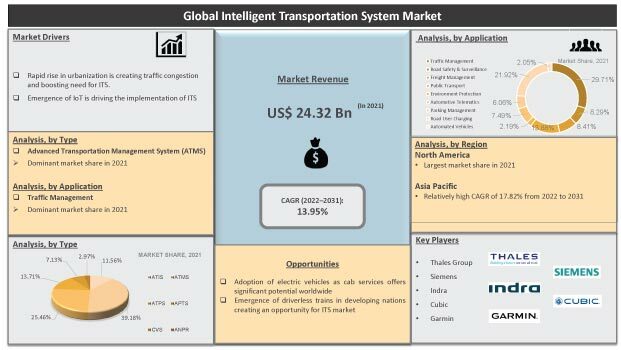 The global intelligent transportation system market features an increasingly fragmented, thanks to the presence of several globally prominent players, notes Transparency Market Research (TMR). A number of key companies consider strategic tie-ups with regional and indigenous companies as way to bolster their positions in the global intelligent transportation system market. TMR observes that such strategies also help them steadily consolidate their supply chains. A growing number of players who vie for prominent shares in the global intelligent transportation system market are capitalizing on rapidly emerging avenues in urban mobility for smart cities. Profuse opportunities come from the rising potential of intelligent transportation system for traffic management. The global intelligent transportation system market stood at US$20.22 bn in 2015 and is expected to clock a robust CAGR of 12.7% during 2016 - 2024. This represents a revenue worth of US$57.44 bn by 2024 end. Of the various key product types, advanced transportation management systems (ATMS) served the maximum demand in the overall intelligent transportation system market in 2015. The segment is likely to retain its dominant position in the next few years as well, at least till 2024. Abundant demand in the segment is due to vast potential of ATMS in traffic management solutions in various countries across the world. Regionally, North America currently generates the major share of revenue in the global intelligent transportation system market. The opportunities in the region ride on back of considerable government support, and rapid research and development activities to realize the potential of intelligent transportation systems in city mobility. The drive for intelligent transportation system stems from the use of communication technologies in bringing more safety, higher mobility, and increased efficiency the traffic management systems in countries across the world. Intelligent transportation system holds vast potential in brining improvements in a wide gamut of activities in the traffic management. The rising use of internet of things technologies for making the optimal use of transportation infrastructure is also boosting the global intelligent transportation system. The rising popularity of vehicle-to-vehicle (V2V) and vehicle-to-infrastructure (V2I) technologies for improving public transportation is a case in point. Rising application of various technologies for easing traffic congestions is propelling growth in the global intelligent transportation system market. The global intelligent transportation system has gained rapid moment from the rising focus on road safety and efficient infrastructure usage. Increased impetus has also come from the growing governments’ focus in several developed regions and some developing economies on making public transportation more eco-friendly. Moreover, governments in these regions are increasingly focused on making cities smart, where intelligent transportation system plays an integral role. Hence, the system finds rising application in tolling management, ticket management, and transportation pricing. Large shares of revenues in the global intelligent transportation system also come from its application in fleet monitoring and telematics. However, hurdles in the global intelligent transportation system market come from the lack of interoperability and standardization in the technologies. Moreover, a slow growth of infrastructure is restraining the expansion of the intelligent transportation system market. Nevertheless, growing number of public-private partnerships (PPPS) in adopting intelligent transportation system augurs well. Copious spending made by them on electronic fare collection systems is also boosting the market. New revenue streams will also emerge from growing potential of smart mobility solutions for smart cities in various countries across the world.